Why I started trusting my gut for everything and how it changed my health forever. Do you ever think to yourself, “Dang it, I really want to become better at managing and taking care of myself,” but then you get stuck in the hamster wheel of, “If I didn’t have to work this job, I would have more time to devote to myself, if I didn’t have to (fill in the blank), it would be easier for me to get healthier.” Or, the thought of going on another “diet” and thinking about all the wonderful food you “have” to give up makes you immediately delete that thought from your head and then feel like welp, this is how my life and health are going to play out, while thinking that you are just dealt the cards you’re dealt and that’s it? What if I told you that, 1.) YOU are in charge of your health and no one else. 2.) Yes you are dealt cards and they are called genes, but, that doesn’t always mean that you can’t edit their expression. 3.) You do NOT have to go on another diet, ever again to be healthy? Yep, that even means if you are overweight. You may be thinking, this woman is crazy, does she even KNOW what all I’ve been through, how crazy stressful my job is and that I’ve dieted since I was 15? You see, I’ve been through this myself. As a former professional ballerina, my life revolved around looking at myself in the mirror in pink tights and then thinking, wait, obsessing, over food. When I mean obsessed, I would read every shape magazine, implement all of those fatigue fighting foods, fat fighting foods, blah blah and guess what, I STILL ended up with an eating disorder. Would I admit it at the time, hell no! When my eating disorder landed me injured multiple times to the point where I was “done” dancing at age 23, I knew there was an issue and I had to do the work. Did I want to, nope, not at the time. So I went to massage therapy school. Ignored it. Shoved it under the rug. Things got worse. I gained weight and was very uncomfortable in my own body. Keep in mind I was in massage school so every afternoon, I was giving and receiving a massage, pretty damn intimate with the body you could say. At that time I was also suffering from terrible migraines and not being able to poop. It sucked. Really sucked. I’ll never forget the night that I was sitting in my apartment in buckhead thinking, “Colleen, something has to change and it has to change now.” So I did a google search for nutrition and migraines. At this point, I was over my eating disorder for the most part, but still had some work to do around food. I was terrified of it, it scared the sh*t out of me. Something that was supposed to nourish my body and give my energy, freaked me out. It freaked me out because at this point, I was starting to feel the effects of food on my body. You could say in my early dancing days that I fought my body, I ignored my body, to the point where it literally gave out on me on stage, on opening night, April 20, 2004. I digress, so back to the google search. I stumbled upon a naturopath and booked an appointment. Long story short, I ended up being diagnosed with Celiac disease. I remember thinking, finally answers, but what the hell do I do now? She gave me some basic information, you know stay away from gluten, soy, blah blah. That was it. So, I thought, how is this going to help me figure out what the hell I need to eat to keep me healthy. She sent me out of her office with some supplements and a piece of paper with some restaurants of where I could eat at. Nothing major. I mean obviously, because I was still eating white bread… seriously, that was where I was at. So, from that day on, it was a roller coaster, I felt so alone. I felt helpless, I felt like that girl that everyone takes pity on. Now I REALLY looked like I still had an eating disorder, but I didn’t, so can you imagine the thoughts and struggle especially not having ANYONE to connect to that had dietary issues like myself. I cried a lot, talked to my mom a lot, would stay up late reading all sorts of things about what needed to be done on the diet level to keep myself healthy. I had a long road ahead of me, but I knew I could do it. I wanted to feel better and I would do anything to get there. So, in the fall of that year, I enrolled into school to become a dietitian. Throughout my schooling I was the only one interested in celiac disease, food sensitivities and how the immune system and the gut worked hand and hand to create whole body health. It really surprised me that not a lot of my teachers even knew much about celiac disease. I ended up teaching them through my presentations. I also ended up teaching them about food sensitivities and the role that the immune system played in this. I was a huge nerd, still am, but hey, I was determined to figure this thing out and then once I was finished I wanted to help people like myself. Doing this transition alone sucked. Thank goodness I had my family’s support, well my mom’s first, then the rest of my family began to understand that I couldn’t just “have a bite” nor did I want to after 2 years of this roller coaster. It was a HUGE turning point in my life. I give you all of that story to get here… YOU have the power to change your health. YOU have the power to say NO to things that are not making you feel good. You have the power to get out of that job that makes you feel like crap, stressed out and overweight AND you can create a better life, a more fulfilling life AND make money doing it. Whether that be finding a new job that values the health of employees, or creating your own gig like I did. I am a HUGE supporter of local businesses and 1 man band entrepreneurs like myself. Did I mention that I ate whatever I wanted during this transition to going gluten free? This is coming from a girl who had been obsessed about eating the perfect things to have the perfect body for YEARS! Here is how I did it, I focused on what made me feel good and what made me feel like crap. I started to listen to those little voices in my head, you know the ones that say, “Man, I could really go for a hamburger right now.” Yea, that one. Even if he said, “Gluten free cookies, I need those,” I would eat them. I started tapping into my intuition to guide me during meal time. I had no idea I was doing this, it was just something that switched in me when I decided that I couldn’t find a “diet” plan for celiac people anywhere, so I just made up my own. That took allowing myself to eat whatever I wanted when I was hungry. Paying attention to hunger cues and how my body felt before and after a meal. Eventually, all of the weight that I had gained started to fall off, literally, without me trying. I didn’t work out regularly, I was still creating trust and trying to honor my body’s healing. I did start my yoga practice during this part of my life however, as a way to connect deeper with what I wanted. I took a ballet class every now and then as well. This happened over the course of about 2-3 years. I had to build trust again with my body, something that I had lost since childhood. I trusted that what my brain told me I wanted was what I needed. You see, I’ve never really done anything the “normal way” really, nothing. So I was not going to follow a diet plan to the T when my body was craving something or asking for something else at the time. That would have just created more disconnect and distrust. So, I thought what the hell. About 3 years later when I was eating what I wanted, when I wanted, I took a look at my meals and thought, damn, I just naturally am eating healthy because I don’t want to feel like crap. So I used to say, I was forced to start eating healthy, when in reality, I wasn’t forced, I tapped into my inner knowing, my inner desire to feel great in my body again. THIS is why, if you meet me out in public and people ask me what I do for a living, I hesitate to say “dietitian” because I am SO not your typical dietitian. I do things not the normal way. Strictly because I have used my own body as a test subject, I’ve felt what works and what doesn’t. I’ve felt what being constantly bloated feels like, what not being able to go to the bathroom feels like, what constant diarrhea feels like, what migraines daily feel like, what body pain feels like and I’ve also felt what it feels like to feel damn good. Because of what I do, I was able to run blood tests on myself over time and look at trends before I did it with my clients. I trusted my gut. I will always trust my gut from now on. But guess what, until it was healthy, I didn’t trust it at all. I didn’t even know what it felt like to trust your gut. I didn’t even know what those voices in my head were there for besides making me feel like sh*t in my anorexia days. 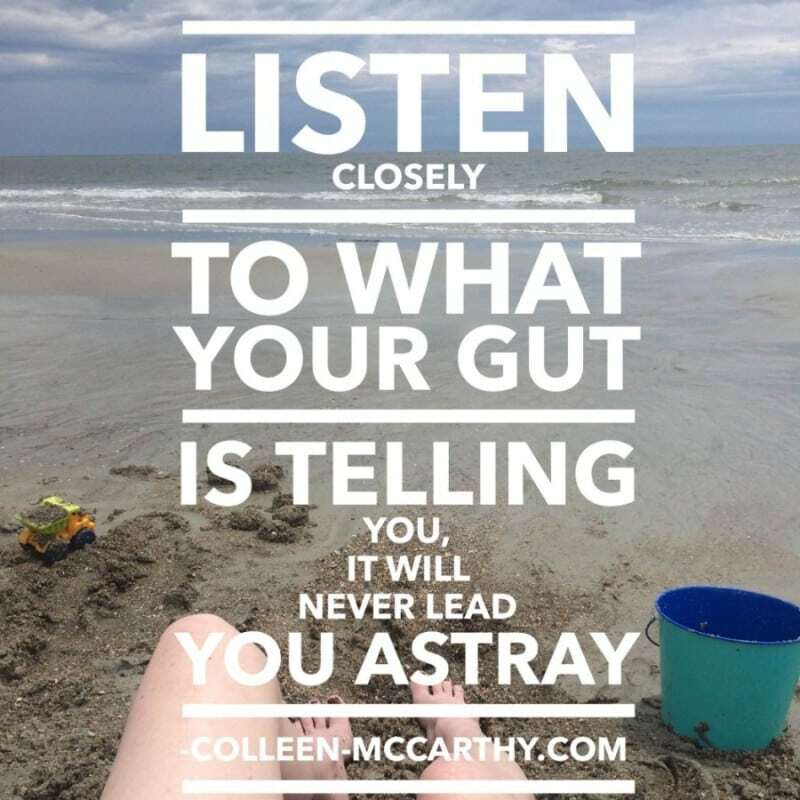 Trusting your gut takes time. It can change your whole life. If you would have told me 6 years ago that I would have a thriving business that empowers women to discover their whole body health with customized coaching programs that create healing habits while working together from the inside out as a way to connect to their intuition and explore what brings them true nourishment, I would have said you are completely out of your mind! And here we are. So, the first step is to reject the diet mentality. Throw out the excess nutrition information, magazine articles and diet manuals that offer false hope of losing weight, quickly, permanently. Get angry at the lies that you have told yourself, the lies that have set you up for failure every time a new diet stopped working and you gained all the weight back. Holding onto the thought that a diet mentality is going to sabotage you and keep you stuck. Letting go of this thought or way of thinking is freaking scary, trust me.You feel damned if you diet and damned if you don’t. Stuck between conflicting fears of if I keep dieting I will slow my metabolism by every single diet I try, if I stop dieting, I’ll continue to gain weight. The fear of, if I don’t stop dieting I won’t stop eating– Reality→ dieting is often the trigger for overeating. Overeating is a normal response to restricting. Once your body knows that it’s going to get regularly fed… it will work for you. Your Inner signals will guide your eating. You have to trust your inner signals. You may not hear them right away, it took me some time to hear them, but once I did, things started to progress. You will not learn how to eat by avoiding social events, counting points, saving food during the day to splurge at night at an event, etc. You have to get your feet wet in trusting your inner guide. I actually just had a lot of blood work done because it had been a while and I would be lying if I said that I wasn’t scared sh*tless to see how I was doing and if I was actually showing on paper how good I was feeling. I got my results over the weekend and I am proud to say that my numbers are beautiful. Cholesterol, glucose, hemoglobin, etc. All perfect. I took that as validation that when you listen to your body, it will NOT lead you in the wrong direction. Trust is where it starts. I am healthier now than I was in my teenage years, early 20’s, well ever, all from just tapping in and going with what my body tells me. You, too, can do this! I would LOVE to hear your thought’s on this. What are your fears about letting go and listening to your body? My fears about letting go and listening to my body are 1) the trust between us is broken because, hey, look at the mess my body’s gotten me into, and 2) more often than not, I don’t hear my body’s messages. We are not yet completely on speaking terms. We have a lot of healing to do. If my body is speaking to me, she is whispering. I need her to really speak up and smack me over the head to get my attention. I’m sure it will get better with practice, but for now, while this makes SO MUCH sense, I just don’t know that my body and I are at this place yet. This makes total sense; so much so that I wish I’d figured this out years ago rather than struggling with food and gut issues all this time. I’m so thankful I found your blog; it’s so encouraging and helpful! Have a great day!